Here is my French onion soup as promised! I found these soup bowls at a bazaar a few years back, I love them! It's a nice easy meal to make and to eat. 1. In a large pot over medium heat, warm up the butter/olive oil and add the onions, stirring often until they wilt, about 15 minutes. 2. Turn down the heat to medium low and add the sugar. Caramelize the onions to a nice brown colour, between 30-45 minutes. 3. Add the garlic and sauté for a minute. 4. Add stock, wine, bay leaf and thyme. 6. 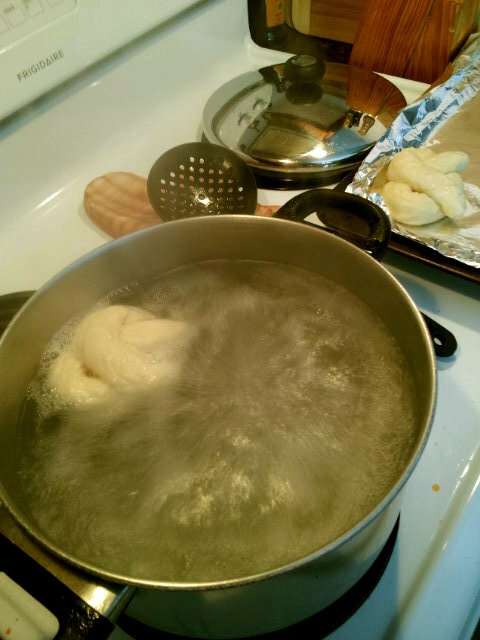 If you have flameproof bowls, add a piece of bread or baguette and top with cheese to melt under the broiler. The original recipe (from Soup by Williams Sonoma) called for leeks as well, but the first time I made it, we really tasted the bitterness of the leeks, it ruined the soup for us. But if you're feeling risky, it's 4 large onions and 4 leeks. Since it was raining all day yesterday, and I got tired of looking through my cookbooks, I was dreaming about baking. 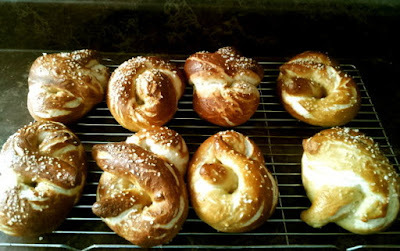 We LOVE these pretzels! They never last more than a few days and with mustard...a triumph! :) I thought I'd post my recipe. One of the series we watched online was Alton Brown's Good Eats. That was a great show and we learned a lot about cooking techniques. I use his recipe for Homemade Soft Pretzels, except I find they need more time in our oven, so I cook them 18 minutes (he recommends 12-14). 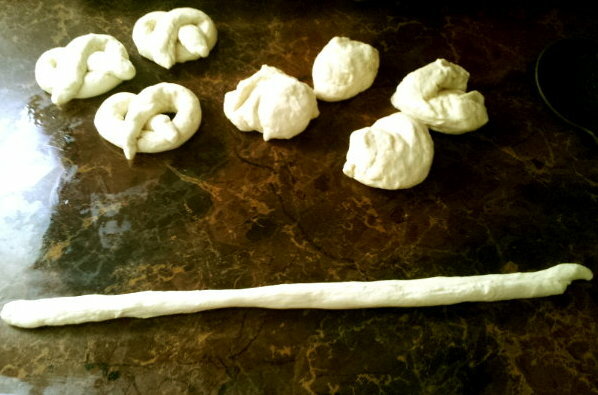 I use foil and parchment paper a lot because we have old pans that we don't necessarily want to cook our baked goods on. IF you use foil, GREASE IT...those pretzels STICK like crazy and the first time I made them I had to rip them off the foil! 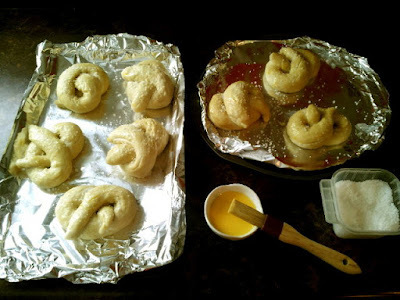 Also he lists "pretzel salt" to top them off with, but I never found such a thing here, so I used Kosher salt. So the party is over, winter is back and it's snowing today! I have a list of baking I want to do and I have my shopping list to finish. I hope everyone has a nice day! I love soft pretzels, but - alas - there is not a good GF alternative that I am aware of. Your onion soup looks so delicious! 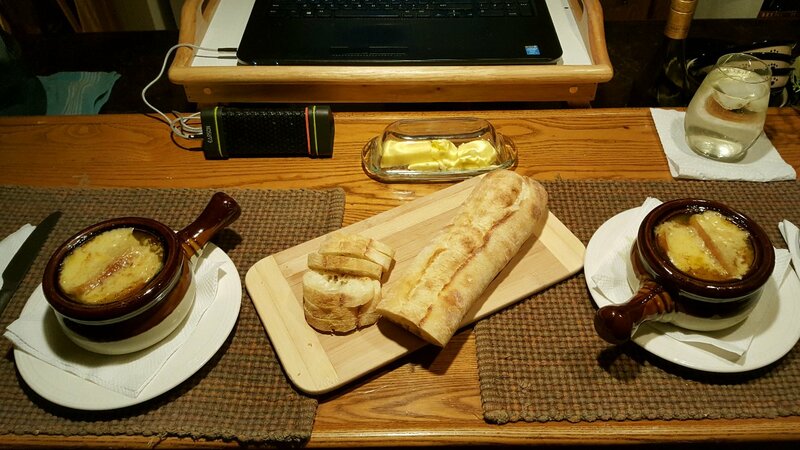 A perfect meal for a still-wintery night. Hi Susan, I feel for you...I was diagnosed with IBS in 2010 and told it was "something you'll have to live with"...so I went on a vegan, sugar-free, gluten-free program for a year to try and cure myself and I had a lot of trouble adjusting and finding ways to bake. I found out in the process it was certain types of dairy and sweets so I gradually started reintroducing the foods I used to eat. Gluten seems to be in EVERYTHING though. The onion soup was perfect for last night as the temperatures plunged! yum! i made breakfast for dinner last night! Oh that's great Joyce! :) We're hooked now! Hi Nik :) I love reading blogs for food ideas. It's hard to come up with new and delicious meals, we get bored so easily with the same meals over and over. That's so funny. 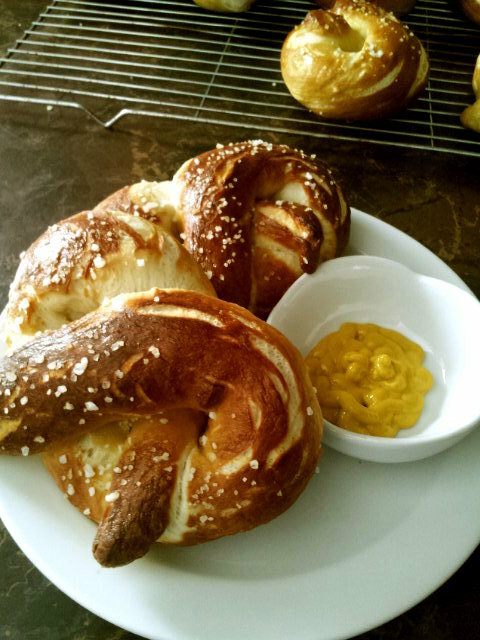 I have a soft pretzel recipe I've been wanting to try, but I don't have pretzel salt. I'll have to look harder for it now. Or go without. They look yummy. They are really good Kristina, very filling too. I'm sure in a pinch regular salt would work though the bigger pieces give it that great taste! I am definitely trying your onion soup recipe. I've tried but have never made an onion soup that I really like. So having yours that I know has been tried and liked by "a real person" is great. Also, the pretzel recipe looks yummy. My dear husband won't be crazy about them because he doesn't like anything that is "doughy" or screams "carbohydrates!" to him. But I'm sure I could eat them all . . . and they'll appeal to my daughter (who inherited my carbohydrate tooth from me). 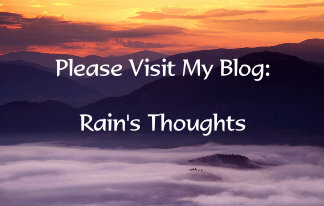 Thank you, thank you for all these good food ideas, Rain. Hi Mama Pea :) I missed your comments! :) You're so welcome for the recipes, I'll keep posting them. 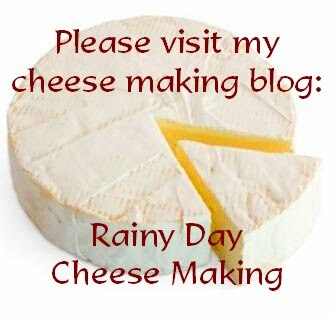 I get lots of meal ideas just from reading other people's blogs and what they're cooking. I love it. My bf is very picky about bready things too. But the pretzels, he could eat 4 for dinner and be very happy about it lol...after one with lots of mustard, I'm done, but they are addictive! The onion soup is DELISH. I find that the problem with most onion soup recipes is that they just say to toss the onions into the pot and simmer, these are caramelized and that makes all the difference! !